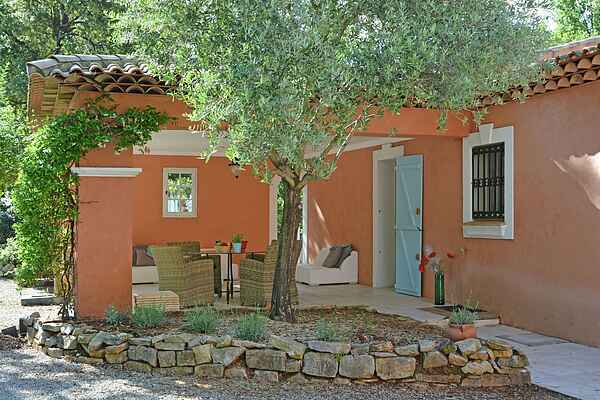 This beautiful country estate with enclosed guest rooms for a total of 18 people is in a tranquil part of Provence, only a stone's throw from the fashionable beaches of Sainte Maxime and Saint Tropez. Trans-en-Provence is a lovely, picturesque village, built on the cliffs with a river flowing beneath it. There is a host of restaurants and shops to choose from. There are several golf courses in the area and plenty of options to explore the Provence on foot or by bike. The location, a stone's throw away from the sandy beaches and at the same time in the middle of the Provence, makes it possible to really enjoy everything here. Whether it's sailing on a yacht along mundane coastal resorts, deep sea diving the clear waters, renting a canoe and sailing through spectacular canyons; everything is possible. It's also very nice to go strolling over the boulevards and to sit down and enjoy one of the outdoor cafes. The estate is set in truly magical grounds and offers fine views of the surroundings. Because they are high up, the terraces and the swimming pool are flooded by sunlight throughout the day. The spacious, covered terraces offer plenty of shade, and with comfortable dining sets awaiting you. Such tranquility, such space and such freedom. The level garden is suitable for various recreational activities. The walk-in pool is unique with its lovely shape and size of no less than 200m2. The playful design of the pillars adds to the special atmosphere. The first accommodation is suitable for up to six guests and features a large living area with open kitchen. There are three bedrooms and two bathrooms. The living room provides access to the covered terrace with outdoor kitchen. The second home is a loft for 4 people with the second double bed in the mezzanine. There are two bathrooms. Here you'll also find a bordering covered terrace with comfortable garden furniture. The third home is for 8 to 10 people; it also features a spacious living room, kitchen, 4 large bedrooms and 3 bathrooms. Here too a covered terrace with outdoor kitchen. The guest accommodation enables you to enjoy your privacy when you're travelling with a large group, while the large terraces are perfect for sitting together to enjoy al fresco meals. Your house features a spacious, private, covered terrace with complete outdoor kitchen. It exudes space and comfort. A large living room with open-plan kitchen and bar. There are three bedrooms and two bathrooms. All beds are top quality. This is one of our absolute top destinations.